An evil witch named Drawcia transforms Dream Land into a painting and Kirby into a ball. Her magical paintbrush escapes and decides to help Kirby restore his world. As a ball, all Kirby can do is roll around. Tapping him on the touch screen causes him to dash, taking out enemies and stealing their powers. 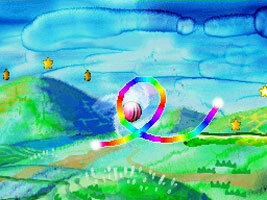 You have to draw rainbow paths to guide Kirby around the world. You only have a limited ink supply, so plan your painted paths carefully. There are three medals hidden in each stage that can be traded in for unlockable items and game modes in Medal Swap. Extra modes include the Time Trial and Line Trial challenges.